Minato Mirai 21 (みなとみらい21) , also known as MM21, is a large urban shopping and entertainment district right next to Yokohama Station. The name means "Habor Future 21st century. Built largely on reclaimed land, the area now features the Landmark Tower, the tallest skyscraper in Japan, the Queen's Square shopping mall, Pacifico convention center, excellent Hotels and more. There are also many entertainment facilities, such as museum, theatre and amusement park, as well as many restaurant. There are many parking spaces. Access, easily from Tokyo. 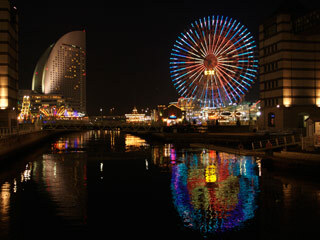 Minato Mirai is built on Yokohama Port which is the first port opened up to foreign trade at the end of Edo period. At the forefront of the Meiji restoration, the first train line in Japan connected Tokyo and Yokohama. There are many ruins from the original ports which now becomes either museum or park attraction. is the tallest building in Japan. THe observation platform on the top 69th floor provides good view (1000 yen). There are over 200 shops and restaurant. There are many restaurants and bars on the top floors where you can enjoy great foods and drink with the excellent view of Tokyo Bay. is the another high-end shopping mall located right next to Landmark Tower. If you like high-end shopping, then you should check out here. Also, there is home to one of the five Pokemon Centers in Japan. So, kids will love it. is also known as Yokohama Red Brick Warehouse is one of popular spot especially for young people. There many hip and young fashion stores in this mall with all reasonable price. Also there are many interesting restaurants and bars. is small amusement park. The Cosmo Clock 21, a 112.5m Ferris Wheel which doubles as "the world's largest clock." The park also has two roller coasters. Admission is free but the rides cost 500 yen to 700 yen each. is the museum with Sailor ship the Ninonmaru. You can enjoy the history of Yokohama port in this museum.